Providing you the best range of wireless system with effective & timely delivery. We are offering Wireless System. 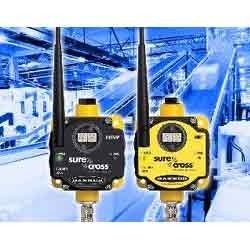 The Sure Cross wireless system from TURCK enables simple and fast transfer of process data from the field to higher level control systems. DX70 (cable substitue) as well as DX80 (complex network) gateways communicate with the fieldbus nodes via radio signals and transmit signals from the field to the control system.